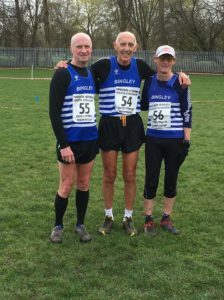 Our vets got several bonuses at this well-organised event on 16 March, which was hosted by Kingston-Upon-Hull AC in the grounds of Costello Stadium. Firstly, the weather; windy, yes, but only light showers; and secondly, MEDALS! The first race (F35+ & M70+) took in two laps of a mainly flat, grassland course with many tight turns and a few short, sharp banks; 3.04 miles according to my TomTom. Lesley Watson was 1st F45 (21:06) and Steph Robson 4th (21:20). The M70 competition was strong, with the first three finishing in under 22:30, which would have been good-for-age on tarmac, but on a twisting grass circuit in a strong, gusting wind, they were outstanding. Peter Ellerton was 6th M70 in 25:46. Les Haynes and Mike Smith were 1st and 2nd M75s (24:20 & 27:03) which, when combined with Peter’s result, made them 1st M70+ team. The second race (M50-69) was a double helping of the first. Stewart McDonald was 10th M50 home in 40:17, John Convery 1st M55 (38:38), Paul Lemmon 7th (43:45) and Rob Eccles 12th (49:08). John, Stewart and Paul were third-placed M50+ team. In the third and final race (M35-49), run over the same distance as the second, Tim Midgeley was our only representative, but he put in a great performance to finish 2nd overall and 1st M35 in 36:54.